Our family of jams and fruit spreads from Scandinavian Delights is growing! We are so excited to welcome the Blackberry and Raspberry Fruit Spreads to our pantry of already delicious gourmet jams. 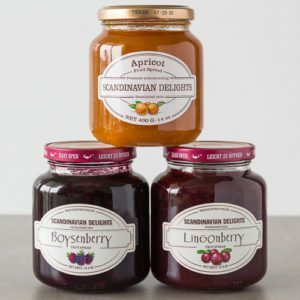 Since we first launched Spoonabilities, the Apricot, Lingonberry and Boysenberry Fruit Spreads from Scandinavian Delights have been our most popular jams. And rightly so. Each one is delicious served on toast, bagels, muffins, breads, crackers, and, well, just about everything! And they add depths of flavors to so many recipes – from main course dishes to desserts and even smoothies and frozen treats. Each jar of Blackberry Fruit Spread, one of the newest additions to the Spoonabilities family, is jam-packed with chunks of robust, fresh, sun-ripened blackberries. 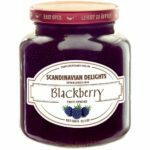 Scandinavian Delights selects gorgeous, ripe, tender blackberries that burst with flavor. We’ve already declared the Blackberry Fruit Spread to be our favorite jam to use for a truly gourmet PB&J sandwich. Try the Blackberry Fruit Spread as a delightful topping on your favorite cheesecake, dolloped over ice cream, mix in with your yogurt or cottage cheese, and spread over a crusty bread. We know you’re going to fall in love with it! The deliciously crafted Raspberry Fruit Spread, our other newest member of the Scandinavian Delights’ line, is prepared following an old-fashioned, traditional recipe. Each jar contains large pieces of the juiciest, sweetest, freshest raspberries that are harvested when they are perfectly ripened and glowing with color. You will love the Raspberry Fruit Spread as a glaze on top of a warm, baked brie. Use it to top waffles, pancakes and French toast. We love it mixed with Dijon mustard and orange zest to serve over meatballs. 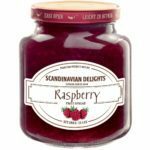 With so many delicious ways of using the Raspberry Fruit Spread by Scandinavian Delights, be sure to keep an extra jar in your pantry! The origins of Den Gamle Fabrik, the producers of Scandinavian Delights, dates all the way back to 1834 to a small shop in Copenhagen called The Strawberry Cellar. The Strawberry Cellar attracted the most demanding Copenhageners who sought to buy exquisite fresh berries and fruits. Next-door to the Strawberry Cellar was a restaurant, only open in the summers, which served coffees, teas, homemade ice-creams, fruit desserts and cakes. In 1922, the Strawberry Cellar began serving its customers year-round, offering various homemade, delicious fruit purées and creams. Soon after, a marmalade factory was established. The marmalade was prepared by hand with the greatest care in large open pots using the Strawberry Cellar’s very own recipe. Den Gamle Fabrik has been creating delicious jams for more than 175 years. To this day, Den Gamle Fabrik adheres to their old craft principles, and they never compromise when selecting the berries and fruits that go into their products. Jams and fruit spreads are slowly made using open pots without boiling, just like in the old days, and then poured gently into glass jars. In this way, the raw fruits and berries preserve their natural flavors. 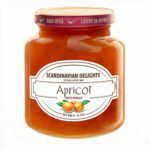 Only the finest and juiciest apricots go into each jar of Scandinavian Delights Apricot Fruit Spread. Scandinavian Delights apricots grow in warm, sunny climates to create large and juicy fruit. Each jar is full of large slices of fresh and naturally sweet apricots. I love spreading a healthy spoonful on bagels and on homemade muffins for a quick, yet special, tasty breakfast. 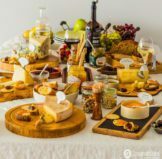 Create an “Ooh La La” super easy, and very fancy Apricot Brandy Brie appetizer, or a Ginger Apricot Chicken with Apple Brandy Mustard or even Apricot Cheesecake Muffins. Use it as a glaze for a pork roast or to glaze a roasted chicken or turkey. The natural sugars and flavors create a delicious coating that will have everyone at your table going for seconds! The Lingonberry Fruit Spread is our number one selling gourmet jam. The lingonberry fruit’s unique and intense flavor is similar to huckleberries or cranberries. 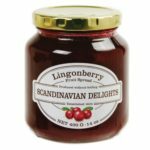 Lingonberry Fruit Spread from Scandinavian Delights is prepared using only the finest berries. 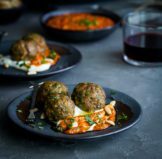 We love it over pancakes or served as a relish over Swedish Meatballs. 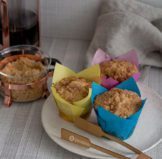 We have also made Coconut Cream Lingonberry Pops and Lingonberry Hazelnut Coffee Cake. This is our favorite jam. Once you’ve tried it, I know it will become your family’s favorite jam too! 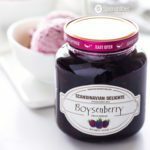 Made without boiling to preserve consistency, flavor, freshness and homemade taste, the Boysenberry Fruit Spread is rich, delectable and naturally sweet. 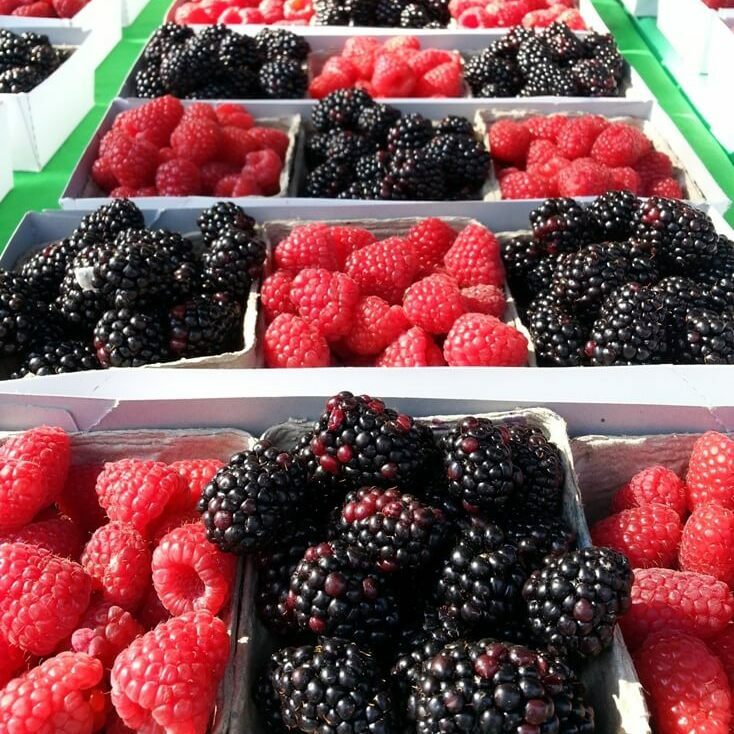 Each jar is prepared with the most superior and ripest berries. We love this fruit spread to top fruit tarts, pancakes, waffles and French toast. Try mixing it in with your favorite vanilla ice cream to create a super easy, two-ingredient ice cream dessert. You’re going to love it! We hope you’ve enjoyed learning about the history of the Scandinavian Delights Fruit Spreads. We hope too that you will try one or all of these delicious fruit spreads from Scandinavian Delights. Our top selling Scandinavian Delights Fruit Spreads are also available in a Gourmet 3-pack. The Jam Trio Scandinavian Delights Fruit Spread Gift Set makes a wonderful gift for your special friends and family members. Geoffrey’s mother and aunt can’t get enough of the lingonberry fruit spread and the apricot fruit spread. They spread them on toast every morning. Let us know which is your favorite. We love hearing from our customers!